Fleming’s Prime Steakhouse & Wine Bar is an ongoing celebration of exceptional food and wine. Indulge yourself with the finest aged prime beef and discover new tastes with our award-winning wine list, featuring 100 wines by the glass. Known for its warm, inviting ambiance Fleming’s features an open dining room built around an exhibition kitchen and expansive bar. Adjacent to the main dining area are private dining rooms that can accommodate small or large groups. Fleming’s lively atmosphere, gracious service and dedication to excellence turn evenings out into memorable times. For more information and sample menus, visit www.FlemingsSteakhouse.com. National Gift Card is the best place for you to order Fleming's Prime Steakhouse gift cards in bulk. We are the experts in all things gift cards and can set up your gift card solutions program for you today. Please contact us for more information on Fleming's Prime Steakhouse bulk, direct-to-recipient, or individual gift card fulfillment for your gift card program. Contact us here or call us at 888-472-8747 today! Use of card equals acceptance of following terms; Redeemable at any of our restaurants in the United States, Puerto Rico, or Guam. Card has no replacement value if lost or stolen. No returns and not redeemable for gift cards or cash except where required by law. Treat this card as cash. For locations and balance information visit please bloominbrands.com. 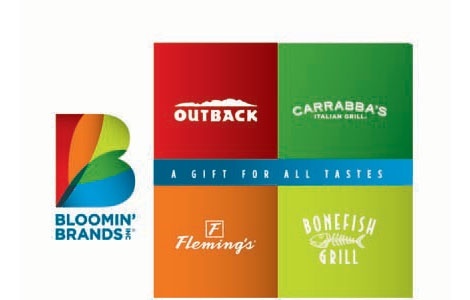 Bloomin’ Brands, Inc., Outback Steakhouse of Florida, LLC, Carrabba's Italian Grill, LLC, Bonefish Grill, LLC, and OS Prime, LLC are not sponsors or co-sponsors of this promotion. Please see back of gift card for terms and conditions of use.